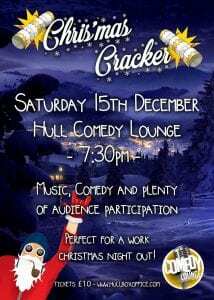 A musical cabaret evening full of fun and festive frolics starring Hull’s own stand-up comedienne Lucy Beaumont and hosted by the ever fabulous Christopher Holmes. Last years event was a sell-out, be sure to book your tickets in advance to avoid disappointment… This event would be PERFECT for your staff Christmas night out! Please note this event will take place UPSTAIRS at the Comedy Lounge, Hull.